A third winning weekend at Genk, a string of victories to show that Belgium is a land of conquest for Matteo Viganò. After a bittersweet European Championship, concluded with a DNF and a fourth place, great was his ambition to show his mettle on this circuit. Genk, the perfect opportunity and site for Viganò, a track he has won at for now three years, in KZ2. In 2016 and 2017, the historic Belgian facility had value for the European Championship, and on both occasions, Viganò won. In 2018, yet again, mastery over the circuit right from official practise with the first absolute time (54.411), good for pole in group A. To the fastest time, he quickly added five victories of the six available. Truly overwhelming, enshrined in the first starting position for the finale. 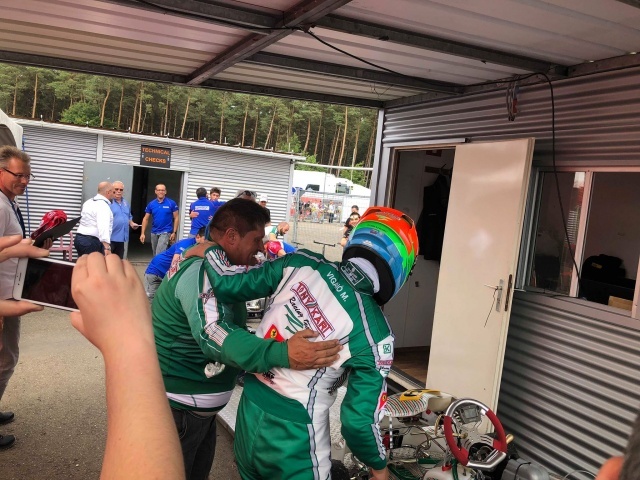 The infernal pace, constant and managed in an intelligent way by Viganò, were enough to have the driver cross the finish line alone in front, with the title of International Champion Super Cup KZ2, now in his pocket. «We were at the top right away, in all the sessions. I knew who I'd be up against after the heats and I fought in the race. It was tough in the final. I managed tires and gaps but I did not know how much to push. In the end, it went well. At home they worked well and the results prove it. We are very happy with it all». Success that bodes well for the future of the Tony Kart driver, probably next heir to the struggle for success in KZ.